Naga Pancham is celebrated on the fifth day of the waxing moon of the shravana month. It is Shravana sukla panchami. On this day people go to the sanke pits or to temple of Subramanian or form a replica of snake pit at home with some flour and offer their prayers along with milk and fruits. Once , in the kingdom of Pandya there lived a poor Brahmin by the name Vedasharma. He had eights sons and a daughter. The name of the daughter was Suseela. 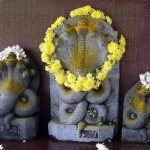 Once a Snake comes to her seeking refuge from Garuthmantha(the king of birds) and asks her to protect him from Garuda. The daughter agrees and starts to take care of the snake. Pleased with her, the snake used to give a gold coin every day. This continued for a long time and the Brahmin soon was out of poverty and started enjoying a good life. The sons of the Brahmin in view of getting all the gold coins at once, assuming that they are in the stomach of the snake, try to kill it, when their sister is away. The snake kills everyone. The daughter returns home to find her brothers dead and understanding that the snake has killed them, prays to Lord Vishnu to help her and to forgive her brothers of their ignorance and bring them alive. Lord Vishnu then calls upon the snake Vasuki and asks him to bring life into the brothers which Vasuki does with the help of Sanjeevani Ras. Lord Vishnu then also gives a boon to the Brahmins daughter that who ever worship the snake on this day, the worship would finally reach him and he would grant them with prosperity and children. 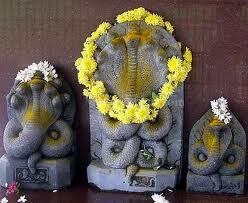 The day was and hence forth people celebrate this day as Naga Panchami. Once there lived a Brahmin, who used to earn his living doing agriculture. Once while ploughing the land, he kills the children of a great snake. The snake gets angry and vows to kill all the children of the Brahmin. The Brahmin had a daughter and when the snake goes to the home to kill the daughter, it sees that the daughter is worshipping the snake lord and so pleased with her she not only blesses her with prosperity but also brings life back to all her family members. It is said that from that day onwards, people do not plough their land on the day of Naga Panchami. It is is believed that Lord Krishna had saved the Gokulu from the many hooded snake Kalia. The snake was residing in a lake near Gokulam and people were afraid to even go to that place. Once Lord Krishna visits that lake while playing and he fights the snake to save the others. It is said that while Krishna was about to kill the snake, the wives of the snake pray to Krishna and pleased by their prayers leaves Kalia. He then emerges out dancing on the hoods of Kalia. It is said that it is Shravan Sukla Panchami that Kalia was defeated and from then on it is celebrated as Naga Panchami.